In two recent posts, I talked about the Karmapa International Buddhist Institute (KIBI), New Delhi, and KIBI's Buddhist Studies program. This post is somehow related in that it is dedicated to the town of Delhi. Delhi (or Dilli) - Truly an amazing city? Delhi, capital of incredible India, is quite an amazing city. Still, many tourists visiting India consider it merely a place you have to pass through on arrival and departure, or in order to change planes or trains. Very often Tourists will stay at a hotel in Paharganj, a Tourist area close to the New Delhi railway-station. It is one of these ugly and noisy places you can find in many big city. It’s a place one rather wants to avoid. 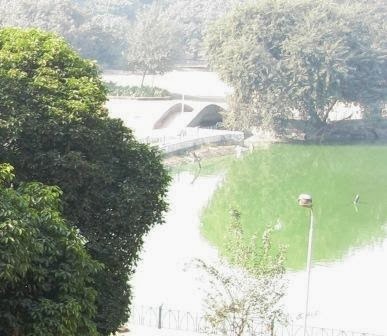 Therefore, it is not surprising that many wrongly think of Delhi as an awful city. 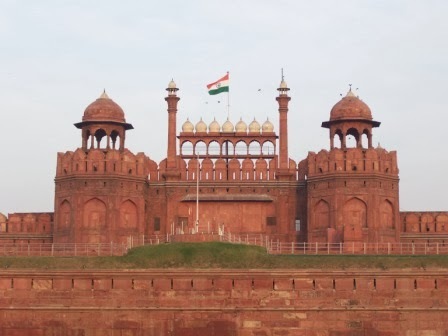 With more than 22 million inhabitants, Delhi is the largest city of India, sometimes also called a city of cities. For a town of this size, it is normal to also have some ugly sides to it. The level of pollution is for instance very high. Many people who come to India for the first time will therefore notice a particular smell. For others who visited India many times before, it is this scent which will make them feel at home the moment they leave the plane. But Delhi has much more to offer. Its history started long before the Common Era. Having been the capital of many historic empires, it has a rich heritage and an enormous amount of monuments. Many of them are well-known, such as for example the Red Fort, Humayun’s Tomb, Qutab Minar, Chandni Chowk, India Gate and so on. Tourists generally believe that they can’t do without seeing the Taj Mahal. Let me tell you, a Delhi sightseeing is very well worth it, too. If I would have to choose between spending a day with sightseeing in Delhi or the Taj Mahal, I would definitely go for Delhi. Not that the Taj Mahal isn’t spectacular, but all of these different places of Delhi taken together will easily make up for it. The complex of the ancient Hauz Khas Fort is a relaxing area which might be particularly interesting for those staying at the close-by Karmapa International Buddhist Institute. 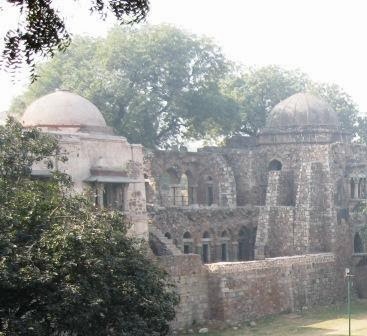 Hauz Khas, meaning “royal water tank”, houses the ruins of a complex which has been build around a water tank. It was established by Allaudin Khiliji (ruled from 1296-1316) in order to supply his capital Siri. Siri was the second of the seven medieval cities of Delhi. The historic complex further houses a mosque, the tomb of Firoz Shah Tughlaq (Sultan of Delhi, 1351-1388), and the ruins of an ancient Islamic madrasa. The modern structure includes now also a lake and a deer park, and the area has many nice shops and restaurants to offer. My personal recommendation is to visit the Naivedyam, an excellent South Indian restaurant. This is one of my favorite places in Delhi, and I try to visit it every time I’m in town. 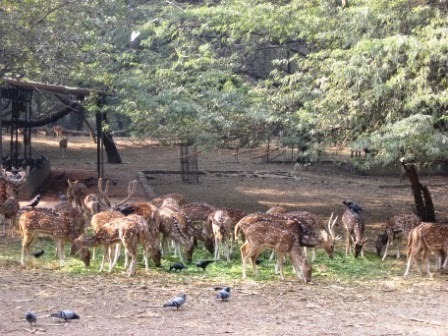 Stretched out about 90 acres of land, Lodi Garden is a wonderful English garden established on a historic site with many monuments from the 15th and 16th century. Most of the monuments are Islamic tombs of the Lodi dynasty which ruled large parts of Northern India. It is a popular place for picnic and relaxation. There are many wonderful markets all over Delhi such Chandni Chowk, Sarojini, Dilli Hat and so on. It is great to spend some time shopping there, talk to the people or just walk around. Here some impressions from a small market close to Mata Mandir, Jhandewala. Want to read more about Delhi? A breathtaking novel by Kushwant Singh which takes you on a journey through the history of Delhi. Whenever I traveled in India, I heavily relied on the information of the Lonely Planet. It has a lot of valuable information. 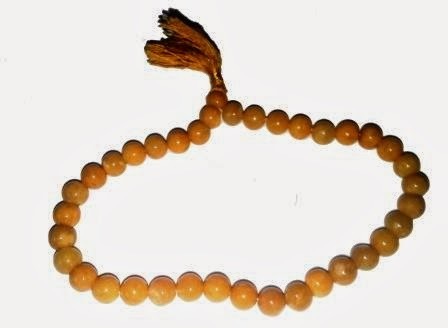 Who can tell us whether we makes progress in our Buddhist practice? Many people who practice Buddhism or other spiritual paths for years are uncertain whether they make good progress in their practice. They believe that they have to go and see a Lama or teacher to find out. Some teachers may be able to actually help you with this. There are of course some outer signs which can hint to good spiritual progress. Still, there is in fact one person who can really judge our progress properly. No, I do not mean our husbands, wives, or close relatives, even though they may serve as an indicator. The only person who will really know best about the progress of your practice is YOU.